A rising proprietor of Brisbane pubs has submitted a development application for a 14-storey commercial tower above the heritage-listed Jubilee Hotel within the Bowen Hills priority development area. The application for the mixed-use project was submitted by a subsidiary of A. N. Burnett Investments Pty Ltd, owned by local pub baron Tony Burnett who runs a series of pubs and liquor retailers across Brisbane, including the Jubilee Hotel. The project incorporates the retention, refurbishment and revitalisation of the existing State heritage-listed Jubilee Hotel, the delivery of a new 250 square meter ground floor publicly accessible plaza, and the construction of a 14-storey retail and commercial office tower. The building consists of 18,166 square metres of commercial office space including a “start-up” hub within the buildings podium. Located within the EKKA precinct of the Bowen Hills Priority Development Area -- at 470 St Pauls Terrace, Fortitude Valley -- the Jubilee Hotel site is situated prominently amongst a string of redevelopment that aims to revitalise a tired part of inner Brisbane. 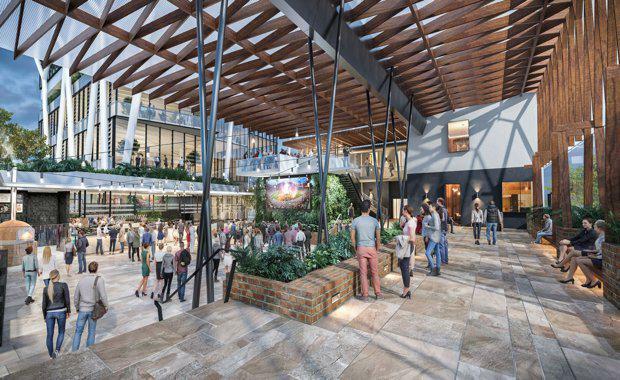 Sharing close proximity with Lendlease's King Street masterplan, the Jubilee Hotel redevelopment has the potential to further strengthen the connection between the Fortitude Valley and RNA Showgrounds. 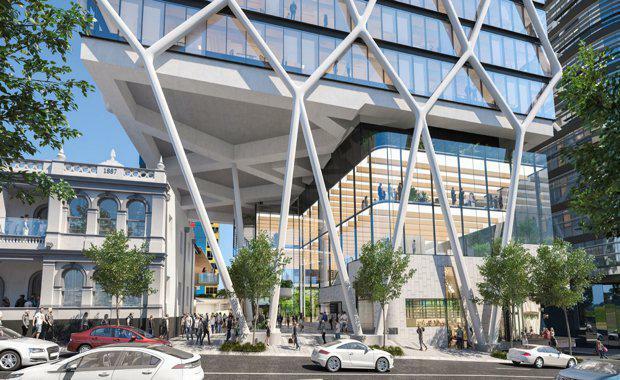 Designed by Blight Rayner, the development will seek accreditation for a 6 Star Green Star, 5 Star NABERS and Gold WELL Building Standard, providing amenities oriented towards healthy, flexible and engaging workspaces. The building's form is bounded by a distinct steel structural exoskeleton that compresses and expands -- the first of its kind in Australia. The design and engineering team have placed extra emphasis on reducing the building's weight -- its located directly above Brisbane's Clem Jones Tunnel -- and are using a composite floor construction consisting of steel and timber and steel and concrete, XLam CLT. The material reduces the extreme point loads bearing down on the tunnel. The proposal describes the lightweight exoskeleton and composite flooring as "constructed like a large scale meccano set", which facilitates the cantilevering of the building above the existing Jubilee Hotel. This method of construction results in the process not being reliant upon traditional scaffolding, formwork and pumped concrete, which allows the structure to be erected safely over the heritage-listed hotel whilst it remains fully operational. The project team anticipate this construction method will not only minimise disruption to local residents and businesses but markedly reduce the timeframe of construction. 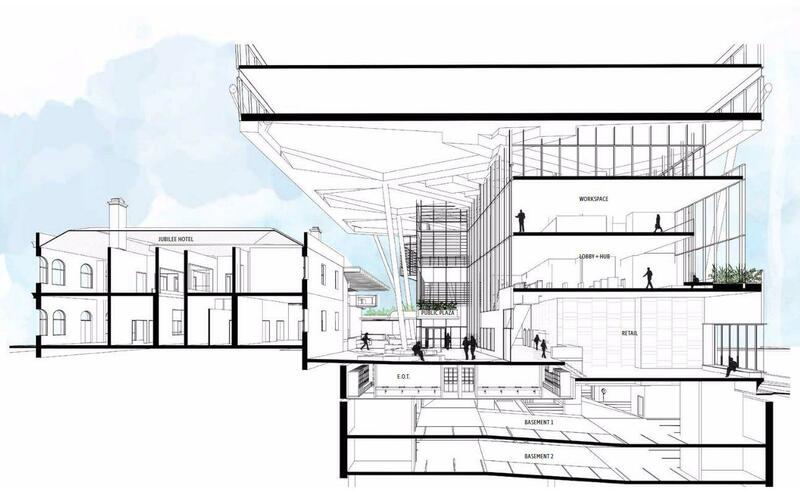 The plans also propose the existing hotel will receive a new external food and dining area, function deck and 203 square metres of retail accessed at ground floor.